Spousal support is an integral part of most divorce cases. It is the amount of money one spouse pays the other for support each month. As one may expect, the divorcing couple often does not agree on the amount to be awarded to the supported spouse, or on the duration of those payments. Fortunately, California law provides a set of factors for courts to utilize when determining the amount of spousal support to be awarded. Since each family law case is different and presents a unique set of facts and circumstances, it is important to understand your rights concerning spousal support under the state code. To ensure that your interests are protected in divorce, you are encouraged to contact an experienced family law attorney from the local San Diego area. A recent California case, Laughman v. Laughman, addressed an ex-husband’s efforts to reduce the amount of spousal support that was awarded to his wife as part of a 2011 divorce judgment. Here, the parties were married in 1973 and separately filed for divorce in 2008. In awarding the wife $11,500 in monthly spousal support, the court also reminded her that under California policy, she is expected to use “full-time efforts” in seeking full-time employment in order to become self-sufficient, in accordance with Family Code Section 4320 and relevant case law. At the beginning of their marriage, the couple lived in Minnesota, where the wife was a licensed psychologist. They later moved to California, which does not have licensing reciprocity with Minnesota. In effect, she was unable to work as a psychologist in California without further training and experience. In April 2013, the husband sought to reduce his ex-wife’s spousal support payments based on her lack of diligence in searching for work and the failure to obtain the necessary hours of clinical supervision needed to become a licensed psychologist in California. Each party presented declarations supporting his or her arguments. The wife provided evidence of a bad job market and her efforts to seek work and to find a clinical supervisor. The husband presented evidence of the wife’s ability and opportunity to find employment and obtain the clinical supervision she needed. The trial court denied the husband’s motion and concluded that the wife had acted reasonably and in good faith, and that her difficulties resulted from her age and a poor job market. She was ordered to continue obtaining vocational counseling services. The ex-husband appealed, arguing that the wife was obligated to make “full-time efforts” in her employment search under the court’s original order. The court of appeals affirmed the decision, finding that the court’s order requiring the wife to make “full-time efforts” included a reference to the Family Code Section 4320 and a relevant court decision. According to the court, these two items must be interpreted together. The requirement of “full-time efforts” is modified by the applicable case law, which held that a supported spouse risks the loss of support unless he or she makes good-faith efforts to obtain employment. Under this reasoning, the court held that the ex-wife used good faith in order to find a suitable position under the circumstances. While this is an unpublished decision that parties may not rely on or cite to in future cases, it is clear that the underlying legal analysis could serve to inform a judge’s reasoning in a case arising under similar facts. If you are confronting divorce, it is imperative that you contact a local, experienced family law attorney who can ably protect your rights. 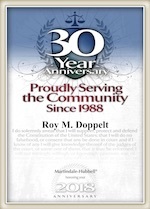 For more than 20 years, Roy M. Doppelt has been representing parties with divorce matters in Southern California. Doppelt and Forney, APLC serves clients in Linda Vista, Encinitas, Scripps Ranch, San Diego, and throughout Southern California. For a free consultation with a dedicated and experienced family lawyer, contact Doppelt and Forney, APLC through the law firm’s website or give us a call toll-free at (800) ROY IS IT (769-4748).